Welcome to Qingdao Unique Hair Products Co.,Ltd. and being glamorous isn’t a hobby, IT’s a lifestyle. See the customers say about our hair extensions. For years I’ve worn hair extensions and I couldn’t find the perfect hair or the perfect method. Because the clip-ins were too bulky. Fusion method took too long and damaged my hair and I just needed something better. I needed better quality hair. So you know the hair I’m talking about. hair that’s healthy. Hair that lasts you know the hair that has thick ends. That’s right, ladies, I’m wearing the Unique Hair Extensions now. And let me tell you because they are amazing. They are your solution to perfect hair and perfect hair extensions. Are you tired of the clip in hair extensions that are bulky and pull your hair and you can’t even put your hair up in a ponytail? Are you tired of those semi-permanent hair extensions that really damage your hair? You found a great solution. 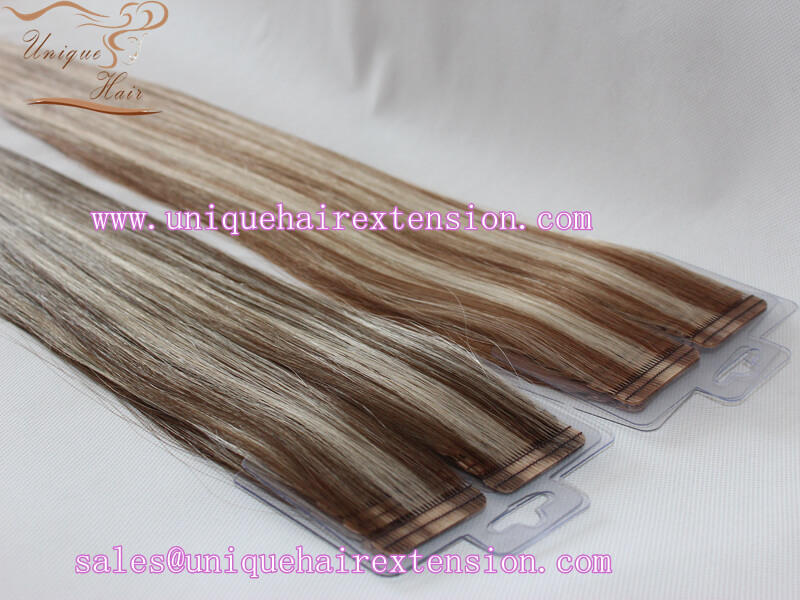 Tape Hair Extensions also called Seamless extensions. IT’s easy. IT’s quick, IT’s fast, and IT’s non-damaging. It is the future of hair extensions. So they look and feel perfect. seamless extensions really are the latest trend in hair extensions. They’re usable, their semi-permanent non-damaging, and they last up to three months. Therefore, never heard of tape in hair extensions. Well, that’s ok. Contact our factory. We teach you everything you need to know. Our tape hair extensions are in salons all around the world. I love tape in hair extensions because it’s easy to use. The hair is amazing and it lasts. Unique hair extensions are natural, lightweight and non-damaging. They’re perfect for weddings, prom, vacation and more. They’re perfect for your glamorous look.